B Raman, while hailing Anna Hazare's anti-corruption movement, refuses to accept Hazare's 'monopoly of wisdom' over the issue. One has reasons to be gratified and at the same time concerned over the direction the national anti-corruption movement led and galvanised by veteran social activist Anna Hazare has been taking since it was launched three days ago from Jantar Mantar in New Delhi. 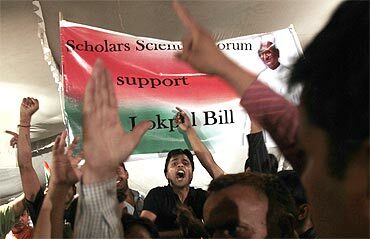 It has shaken up the government's indifference on the issue of corruption and mobilised the urban youth across the country to come out on the streets in support of the demand voiced by Anna Hazare and his supporters for setting up an institutional mechanism to deal with corruption at all levels, with even Prime Minister Manmohan Singh not exempt from its scrutiny and action. The way Indian youth in various urban centres and Netizens have woken up from their slumber on this issue and have risen to the colours of the Anna Hazare movement should be a matter of satisfaction to all the right-thinking people in the country. While we have noted with amazement the way young people have bestirred themselves on this issue, none of us has been able to explain this phenomenon adequately. But we had seen this phenomenon repeatedly in different countries of the world since World War II. We saw it first in France in 1968 when youth power ultimately led to General Charles de Gaulle's exit. We saw it in action the same year in the United States where the anger of American youth over the Vietnam war contributed to then President Lyndon Baines Johnson's decision not to seek re-election. We saw it again on different occasions in Iran, Poland, South Korea, Myanmar (where it did not succeed) and more recently in Tunisia and Egypt. I have been criticised by many and ridiculed by some for comparing the phenomenon of youth in action now being seen in India to the phenomenon of youth in action that we saw in Egypt earlier this year. The main point of criticism is that India has strong traditions of democracy and hence cannot be compared to Egypt ruled by a discredited despot. 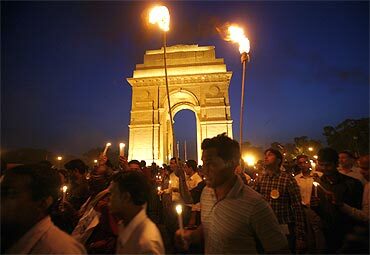 I have been comparing India to Egypt not because I am oblivious of the merits of our democracy, but because I feel unhappy over the state of our democracy which has stopped enthusing the people of the rest of the developing world because of the ills of corruption, nepotism and political insensitivity. I also compare India to Egypt because just as the assertion of the youth power in Egypt forced the powers that be in that country to at least make a pretense of action against the ills confronting the country, in India too, it is only the assertion of youth power that has forced the government to come out of its shell of indifference and insensitivity. Anna Hazare and his supporters have been agitating on the need for an effective institutional mechanism against corruption for years and have re-doubled their efforts since January. The government has suddenly bestirred itself on this issue not just because of Anna Hazare's fast, but because it has been startled by the outpouring empathy and support for him from the youth of the country. Even the television channels of this country largely ignored this movement since January till it saw hundreds of youth coming out into the streets in support of Anna Hazare. 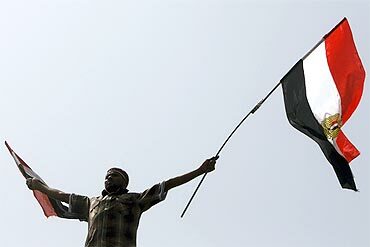 I do feel my repeated comparison to the assertion of youth power in Egypt is apt and cannot be lightly dismissed. But there has been a major difference between the way the 'youth in action' phenomenon worked itself out in Egypt and the way it has been working itself out in India. In Egypt, the youth kept the leadership and initiative in its hands and did not allow an 'ayatollah of democracy' to emerge by taking advantage of the mobilisation of the youth and the assertion of its power. But in India the assertion of the youth power has been sought to be manipulated by some leaders of the Anna Hazare movement -- without his noticing and discouraging it -- to project him as the 'ayatollah of anti-corruption,' who has the monopoly of wisdom on this issue and hence whose wishes and stature in this movement have to be accepted implicitly by the government without any questions being asked. It is this self-assumed and over-projected moral superiority of Anna Hazare over the rest of us mere mortals which should explain the deadlock in their talks with the government and their totally unwise demand that he should be made the head of the joint committee to be constituted for drafting the proposed legislation. There are many of us who are fighting on this issue of corruption for years -- each in his or her humble way. There are many non-governmental organisations across the country which have been creditably fighting on this issue. 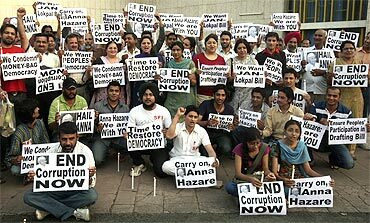 We are all grateful to Anna Hazare and his followers for the way they have galvanised the anti-corruption movement. But, at the same time, I am not prepared to accept that he has superior or a monopoly of wisdom on this issue and that we can do nothing better than to accept whatever he says or demands without subjecting it to scrutiny. We want effective action against corruption. At the same time, we do not want an 'ayatollah of anti-corruption' in our midst surrounded by subaltern ayatollahs. Finally, a humble appeal to the youth of the country. You have succeeded where we failed by directing the spotlight on the issue of corruption. The government is showing signs of action thanks to you and because of you. It is more afraid of your power than of any other phenomenon. The government is terribly confused in its response. 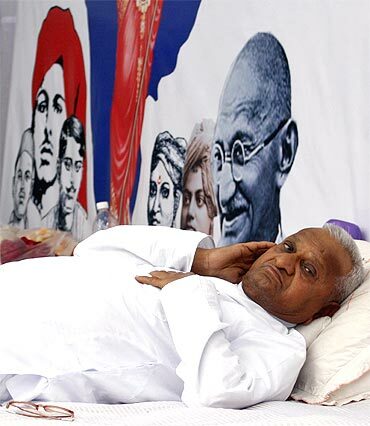 All its efforts have been towards placating Anna Hazare and his followers. We have come to the present messy situation because of the indifference of successive governments to the public anger and disgust over the issue of corruption and criminalisation of politics. It is also because of the failure of communication between the government and the middle class and the absence of a far-seeing political leadership in the seats of power. It is good that even at this late hour the government has opened up its channels of communications with Anna Hazare and his followers. It should also simultaneously establish a dialogue on this subject with the other political parties and with the youth of the country. It should constitute a group of eminent personalities to come out with an alternative approach to the issue of corruption in general and to the institutional mechanism in particular. 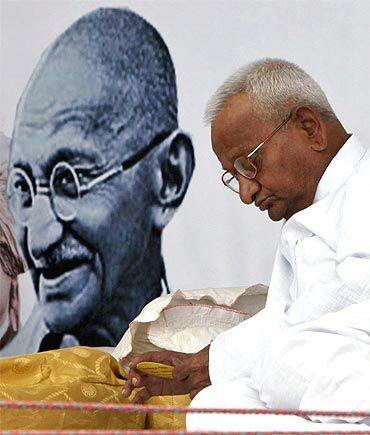 These initiatives should not wait till its talks with the leaders of the Anna Hazare movement succeed.